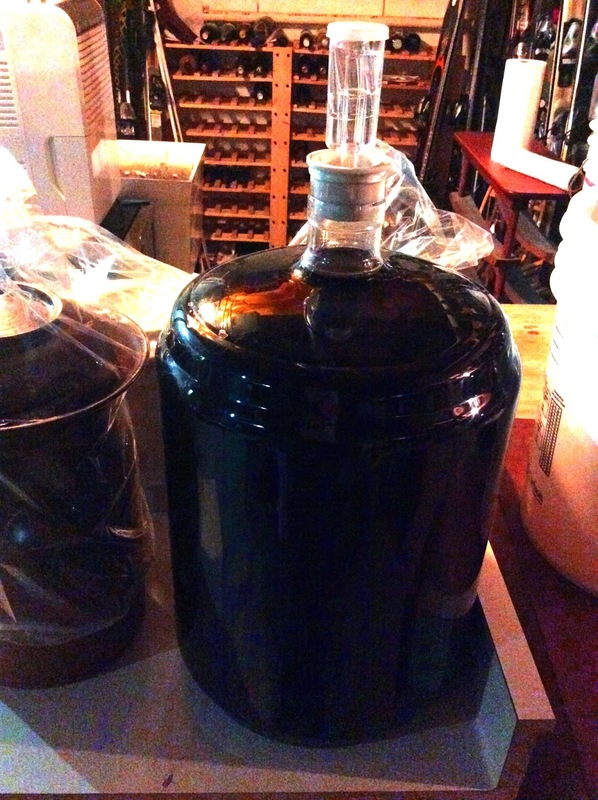 Six gallons of Marquette, aging in the Grotto. 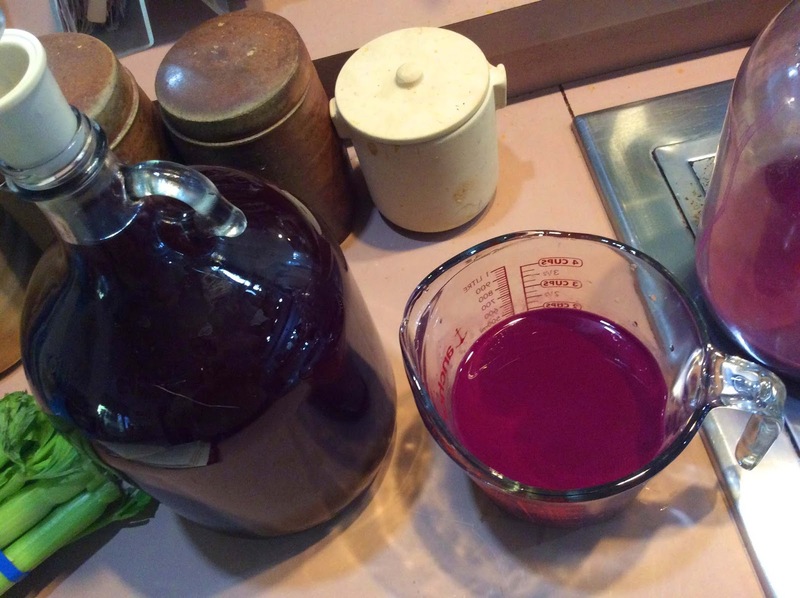 This Fall, we made our first batch of Starrfields wine, using cold-hardy Marquette grapes. We were fortunate to learn the basics from the Vagabond Vintner Kathy Maiele, based in Wilder, Vermont. She patiently led our little group through the process of picking beautiful Marquette grapes at Walpole Mountain View Winery. The winery is beautifully situated on a high, open hill with panoramic mountain views. 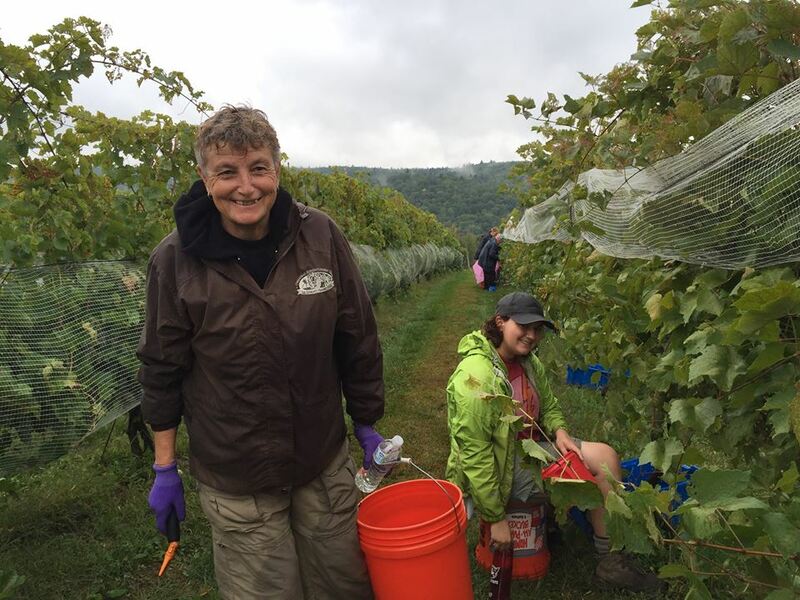 Several carefully-tended acres of grape vines were heavily laden with fruit; each one of us was issued a "grape razor" for cutting the stems, a bucket to sit on, and plastic gloves to avoid "purple hand", then headed for the field. About Marquette grapes: Marquette is a cousin of Frontenac, and grandson of Pinot noir. It was developed at the University of Minnesota from a cross of several very hardy and complex varieties with a French Hybrid cultivar Ravat 262. The grapes have a delicious complexity, and produce a dry, medium-bodied wine. We picked grapes until several large crates had been filled, then the owner of the winery collected them with a tractor and forklift. Altogether, the three groups in the class had picked 277 pounds of grapes! The next step was to crush the grapes, and we faced the inevitable choice: stomp or not stomp. Some people did stomp, but We are not stompers, and used plastic bags to squish the grapes into "Must". This went into several special food-grade buckets,which we packed into Kathy's truck. Overnight, she administered the first dose of sulfites, to kill the naturally-occurring yeasts. This sounds like a nasty thing to do, but these yeasts are killed because they would not create a consistent or complete fermentation. The next day, we met up at Kathy's house to do a series of tests on the must: things like Brix (sugar) level, pH, and specific gravity. We talked about how the fermentation was going to go, and left with a game plan for next steps: the initial fermentation needs to happen at about 70 degrees, which is about the outside temperature at the time you pick the grapes. A couple of weeks later, you press the grapes and do a secondary fermentation at a somewhat cooler temperature, with special added yeast. Because we are beginners and to simplify the process, she had us split our Must into two buckets, each with a different strain of yeast. This way, we are avoiding the secondary fermentation while still adding more complex character to the wine. Mr. Know Whey did all of these things carefully and correctly for a couple of weeks in his kitchen Wine Lab, keeping meticulous notes, while I was otherwise occupied. He did a great job. Each day he did all of these measurements until the yeasts had consumed all of the sugar, and fermentation was complete! It went back into the buckets, and the homework was to let it settle and then do the first "racking" - siphoning it off into 6-gallon bottles called carboys (from the Persian qarāba, meaning great big bottle), avoiding the muck called Lees (a sediment formed from precipitated yeast bodies etc) on the bottom of the bucket. Then we will re-rack it a couple of additional times over the coming months. The siphoning went well, but it did leave almost an inch of progressively more opaque and very vividly purple liquid at the bottom of the bucket. I decided that there was a useful layer above the skins etc at the very bottom, and that perhaps it could be filtered back into the wine. However, using four layers of butter cheesecloth and a chinois strainer, it simply clogged the filter and wouldn't flow. Next best option: cook with it! I poured off about a half gallon total of what seemed usable Lees, and tossed the remaining mud. The Lees was beautiful, intensely fragrant and ready for action. 5 russet potatoes, cut into 2" cubes. 2. Add onions, then carrots and herbes de provence, continuing to turn and brown until some caramelizing on bottom of pan occurs. Don't burn it..
3. Place 2 T olive oil and the potatoes in a large cast iron braising dish. Toss to coat. Turn on the heat and brown lightly in the dish. 5. Add celery to the braise, with tomato paste, chicken stock, sherry vinegar and spices. Mix with wooden spoon. 6. Cover and braise in oven at 375 degrees for 60 minutes. Then remove the cover and braise for another 30 minutes. 7. Test, adjust seasonings, and serve in bowls. Pairs well with another red wine of substance.